Mayo News football podcast 2018 – Tipperary review | Everything Mayo! Mayo’s wanderings through the qualifiers over the last few summers have given the county’s loyal followers plenty of memorable days out. Yesterday at Semple Stadium in Thurles, in sizzling hot and sunny conditions, was another one to add to the list, as well as another back door game that had supporters’ nerves jangling before that blistering late spell saw us make it safely into Round 3. In this episode of the Mayo News football podcast, we bring you all the excitement of the trip to Tipp. Host Rob Murphy and I take you through the rip-roaring contest as it unfolded but while the supporters could relax and enjoy the balmy evening conditions after the final whistle had sounded the podcast was then only getting into its stride. 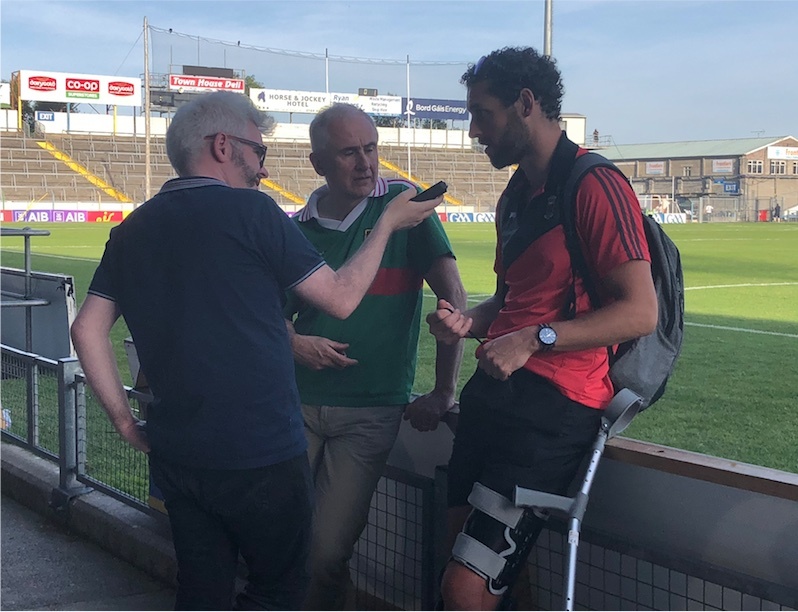 Post-game we hear from Mayo News regulars Seán Rice and Edwin McGreal, with Danny Carey also making a welcome return to the podcast fray off the bench. There’s after-match reaction from Stephen Rochford and Paddy Durcan, while Tipp’s Declan Browne explains what went wrong for his native county. Special guest star Tom Parsons also provides his thoughts on the game and where it leaves us. Not content with all that, Rob tracks down the fans behind the giant Mayo flag that was unfurled on the town end terrace at Semple Stadium yesterday. This jam-packed podcast episode is now online and available to listen to on both iTunes and SoundCloud. You can also listen to it on the Mayo News website or alternatively here on the blog using either the player below or the one on the panel on the right. ?The Mayo News football podcast is proudly sponsored by the Oxford Arms in Camden Town. That All-Ireland preview night over in London is getting nearer all the time! The post Mayo News football podcast 2018 – Tipperary review appeared first on Mayo GAA Blog.